Realizing the talents of their youngest son, Andy, the Roddick family relocated to Boca Raton, Florida, when he was 11 years old. From there, Andy’s career took off. From 1999-2000, he was the No. 1 Junior in the US, and by 2000, he had cracked the World rankings at No. 1. He went on to win six world junior singles titles, and seven world doubles titles. In 2000, Andy also won the Junior US Open, and Australian Open singles titles. That same year, Andy went pro. By 2003, Andy had captured the US Open title, won his first-ever Grand Slam single title, and was ranked No. 1 in the world. For much of the next decade, Andy was ranked in the top 10. He calls his consistency the proudest achievement of his career. Along the way, Andy set many records including, including becoming the youngest-ever ATP Player of the Year in 2003. On September 24th, 2004 at the Davis Cup, Andy broke records again with a record breaking 155 mph serve. Andy reached the Wimbledon finals three times in his career, and the Australian Open semi-finals four times. Andy played in 42 Davis Cup matches, and in 2007 led the United States to victory at Portland, Oregon. As great as Andy’s accomplishments were on the court, he managed to make an even bigger impact off the court. Andy was recognized in 2005 for his community involvement with the prestigious Arthur Ashe Humanitarian Award, and again in 2007 with the Arthur Ashe Leadership Award by the Arthur Ashe Institute for Urban Health. In 2009 Andy followed this up by receiving the Heineken Star Award for achievements in the fields of athletics and philanthropy. Despite this record of achievement, Andy hopes that his greatest success is still to come. Andy founded the Andy Roddick Foundation at the age of 18, with the goal of developing and inspiring underserved youth through sports-based mentoring. Now based in Austin, Texas, the Foundation is focused on expanding opportunities for young people to learn, thrive, and succeed by supporting high-quality programming outside the classroom. Learn more about what we do here. 155 mph at Davis Cup on Sep 24th, 2004; an ATP record at that time. Aug 11, 2003 and Jun 26, 2006. Held ATP World No.1 ranking for nine consecutive weeks Nov 3, 2003 - Jan 19, 2004. In 2013, Andy was named co-host on the FOX Sports 1 Flagship program FOX Sports Live. 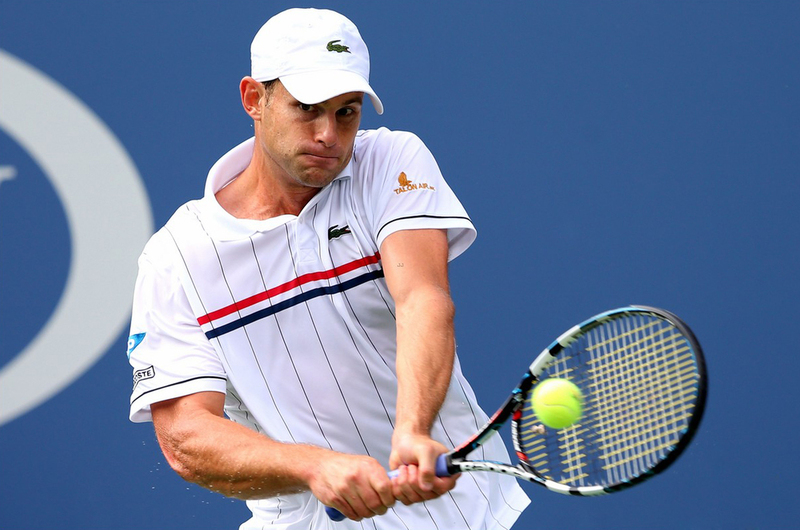 An all around athlete, Andy played varsity basketball in high school alongside Davis Cup teammate Mardy Fish, who trained and lived with Roddick in 1999. Andy hosted Saturday Night Live on November 8, 2003 and is one of only two tennis players to do so, Chris Evert was the other tennis player. Andy married actress and model Brooklyn Decker on April 17, 2009. They are proud parents of two English bulldogs, Billie Jean and Bob Costas. A golf fanatic, Andy is spending much of his early retirement on the links. He participated in the 2013 AT&T Pebble Beach Pro Am. Andy played tennis against New Orleans Saints Quarterback Drew Brees on Austin tennis courts. Brees, three years Andy’s senior, remembered a small kid who beat him on the court while Andy remembers facing a Brees who would frustrate him because of only practicing a couple times a week.